Researchers projected the habitat shifts under a high-emissions scenario and a low-emissions scenario. Hundreds of fish and invertebrate species will be forced to shift north to seek relief from warming waters, potentially disrupting the fishing industry on both the East and West Coasts of the United States and Canada, according to a study from Rutgers University. Some habitats will move as much as 900 miles north because of the warming waters brought by climate change, researchers said. Among the species most affected will be Pacific rockfish, black sea bass, and Atlantic cod, the Rutgers statement said. Morley was the lead author of the study, published Wednesday in the journal PLOS One. Coauthor Malin Pinsky, a Rutgers professor of ecology, evolution, and natural resources, said the shifts in the habitats, which will draw the fish with them, will often mean longer trips and higher fuel costs for fishermen. The study looked at the North American continental shelves on the Pacific and Atlantic coasts. Reearchers used 16 climate models to develop projections for future ocean temperatures. They were combined with statistical models of the temperature preference of various species, based on surveys of fish caught in bottom-trawling, the university said. Researchers found that even if the world were to observe goals set by the Paris climate accords, fish would shift northward. But in a high-emissions future, the shifts in habitat would be two to three times greater, the university said. Studies say the region’s cod population is at historic lows, the Globe reported last year. Pinsky said cod stocks are below what the habitat could support, mainly because of overfishing, but the cod habitat will be moving north in coming decades, according to the new research. 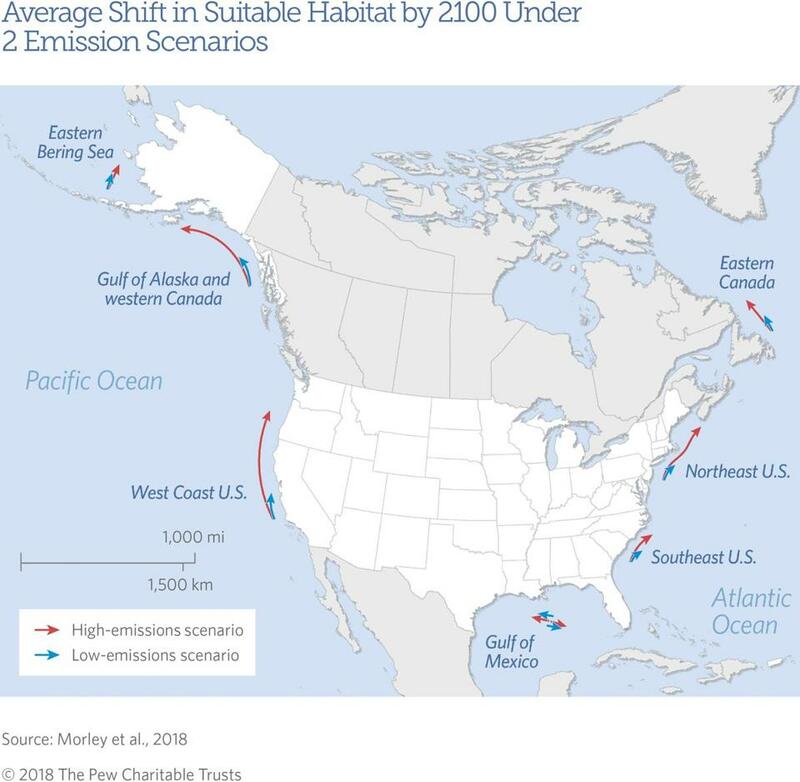 Eventually, the habitat in US waters will dwindle by 90 percent if greenhouse gas emissions continue. The decline would be less severe if the Paris climate accords are successful, Pinsky said in a telephone interview. In the colder waters off Maine, lobstermen have been hauling in record catches. But south of Cape Cod, the industry has collapsed. In some areas, catches have plunged 90 percent below their peak in the late 1990s, the Globe reported in December. “American lobster is projected to shift another 200 miles further north, with much more of the prime habitat shifting into Nova Scotia and even further north if greenhouse gas emissions continue,” Pinsky said in an e-mail.